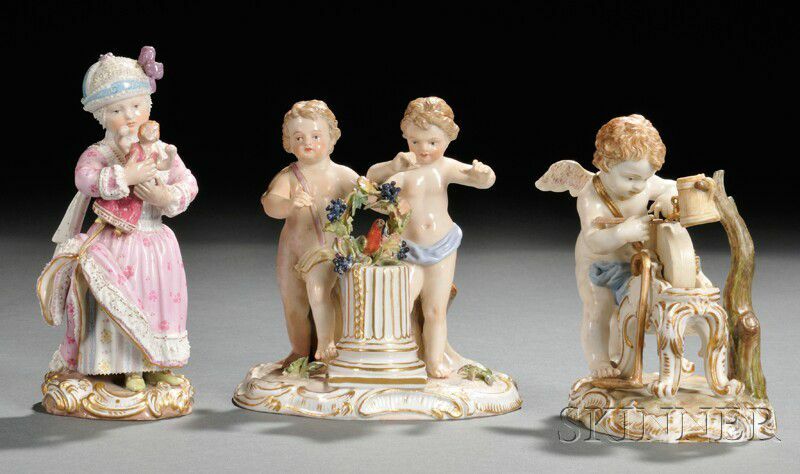 Three Meissen Porcelain Figures, Saxony, late 19th century, each polychrome enameled and gilded, one modeled as a figure sharpening his arrows on a whetstone wheel, with blue crossed swords mark, incised "C. 62," impressed "12," and painted "2," ht. 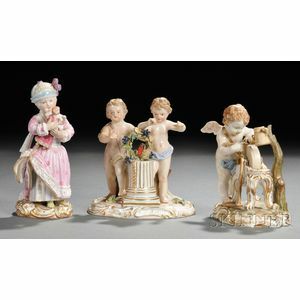 4 5/8; another with a male and female putto resting a grapevine wreath with a perched bird against a pedestal, on shaped base, with blue crossed swords mark, incised "H38," and impressed "86," ht. 4 1/2; the third modeled as a girl carrying a doll, with blue crossed swords mark, indistinctly incised, impressed "147," and painted "19," ht. 5 1/2 in. Wet stone wheel: Good condition. Grape vine wreath group: Scattered loss to applied wreath and foliage on base. Repairs to hands and arms. Girl with doll: Most of hands and doll is reconstructed and inpainted. Inpainting to purple bow on hat. Scattered loss to lacework.